Josiah Cook, a princely performer, is featured in the annual ‘Nutcracker’ treat. His leaps and splits high in the air awed audiences last Christmas season. The ballet career of Flagstaff’s Josiah Cook is also positioned to leap high through his last three years of high school and beyond, possibly even to New York City to apprentice with a major ballet company. 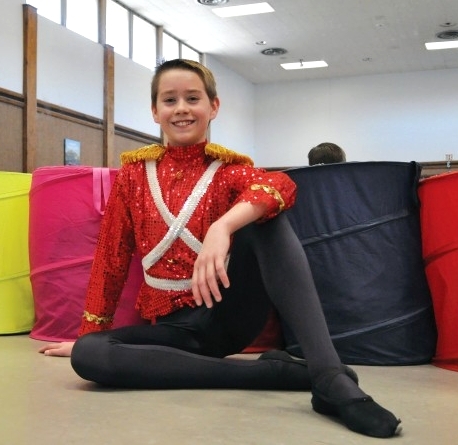 Audiences will again get a chance to be wowed by Josiah, 14, as he performs Dec. 10 and 11 in three roles during the annual “Nutcracker Ballet” in Ardrey Auditorium: Soldier doll, Russian dancer and, a principal part, the Nutcracker Prince. Josiah, who was born and raised in Flagstaff, is in his seventh year with the NAU Community Music and Dance Academy, a branch of the NAU School of Music. The academy was established in 1980 and provides training and certification through the Royal Academy of Dance in London. 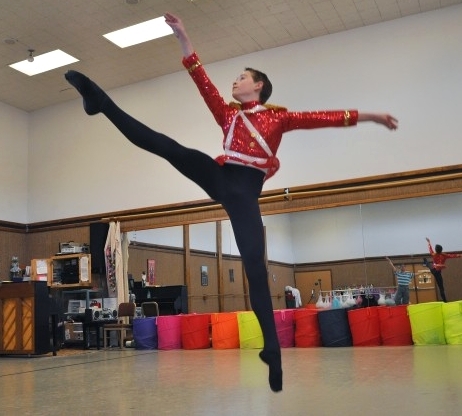 Andrew Needhammer, choreographer and director of the ballet program at the academy, has been working with Josiah from the beginning, including preparing him for many roles in the “Nutcracker” at NAU. Josiah has probably added 6 inches to his frame since last year’s “Nutcracker,” Needhammer said, and hits about 100 pounds and 5 feet, 3 inches today. “We’ve just expanded the parts for him as he’s grown,” said Needhammer, who toured with ABT II, danced with the National Ballet of Canada for seven years and was a principal dancer with Ballet Arizona in Phoenix. Throughout the year, Josiah takes dance classes, alone and with others, for a total of 2 1/2 to 3 hours each week. Meeting this demanding schedule is made easier by the fact that he is home-schooled by both his parents, Dan and Debbie Cook. As show time approaches, practices have intensified, especially since Josiah will be featured in the Snow Pas de Deux, partnered with Wanyi Ng, 16, in the role of the Snow Queen. The two have been practicing hard with Needhammer for the lovely duet, which occurs at the end of the first act. “The mood is definitely a lot quieter and relaxed, and dancing with a partner, also, it’s new,” Josiah said. The dance includes a lot of partnered pirouettes, Needhammer said. To prepare for his dance future, Josiah spent four weeks last summer in Austin, Texas, dancing with the American Ballet Theatre II, a training company which prepares young dancers to enter ABT in New York, as well as other professional ballet companies. “After a few more summer intensives,” Needhammer added.